Authentic homemade gluten-free Tres Leches Cake. 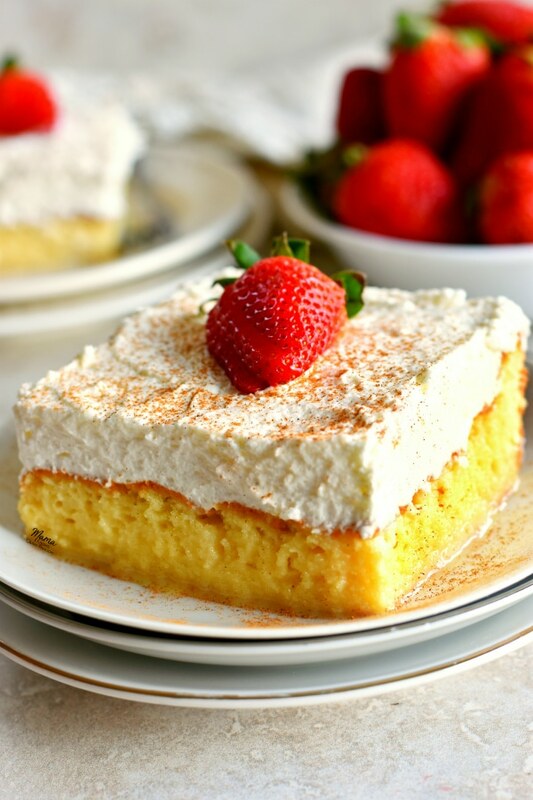 A sponge cake soaked in a sweet milk mixture and topped with fresh whipped cream and cinnamon. 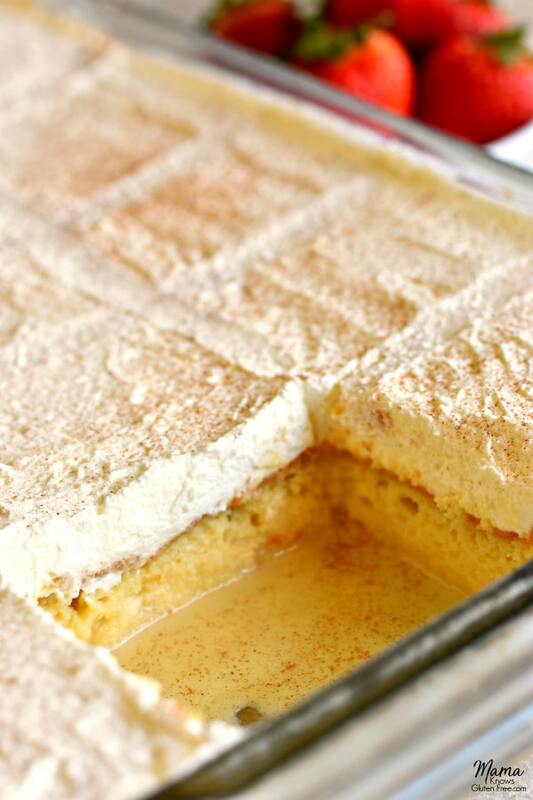 You are going to love this traditional Mexican gluten-free dessert! 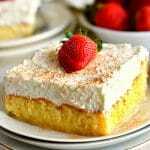 I was first introduced to Tres Leches cake years ago by a dear friend when we lived in Santa Fe, New Mexico. 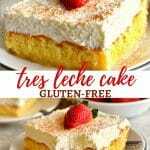 Tres Leches means three milks in Spanish, and this gluten-free cake is soaked in a sweet and creamy mixture of whole milk, evaporated milk and sweetened condensed milk. It is a traditional cake made in Latin America. It is very popular in Mexico and often made for Cinco de Mayo celebrations. 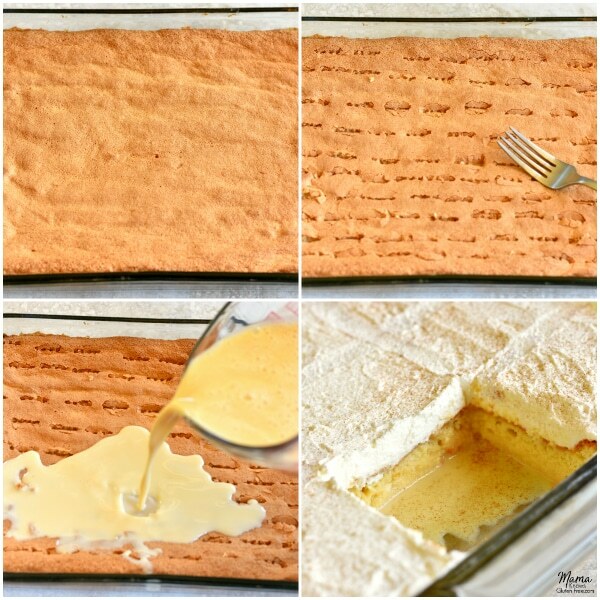 Traditional Tres Leches cake is made in a few easy steps. In a large bowl combine the gluten-free flour, gluten-free baking powder, and salt. Separate the eggs into egg whites and eggs yolks into two separate small bowls. In a large bowl mix the 3/4 cup sugar and the egg yolks together on high speed until yolks are pale yellow. Add the 1/3 cup milk and pure vanilla extract to the egg yolk mixture and mix on low to combine. 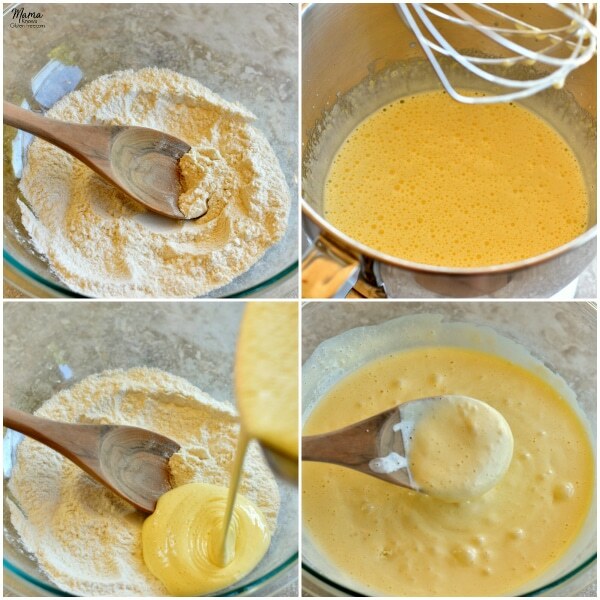 Pour the egg yolk mixture over the gluten-free flour mixture and stir gently just until the ingredients are combined. In a large bowl beat the egg whites on high speed, adding the remaining 1/4 cup of sugar gradually. Beat the egg whites until stiff peaks form. Fold the egg whites into the batter gently, just until combined. Pour batter into a greased 9×13 pan. Smooth the top of the batter to make it even as you can. Bake the cake for 35 to 40 minutes at 350 degrees. Remove from the oven and allow the cake to cool completely. Combine the evaporated milk, sweetened condensed milk, and whole milk in a small bowl and stir to combine. Using a fork to poke holes all over the top of the completely cooled cake. Slowly pour the milk mixture all over the top of the cake. Make sure you pour all over the cake, even the edges. Refrigerate the cake for at least 1 hour or overnight. This will allow the cake to soak up the milk. When ready to serve, whip the heavy cream, powdered sugar, and pure vanilla extract until stiff peaks form. Smooth the whipped cream over the top of the cake. Sprinkle with cinnamon and serve with fresh sliced strawberries. 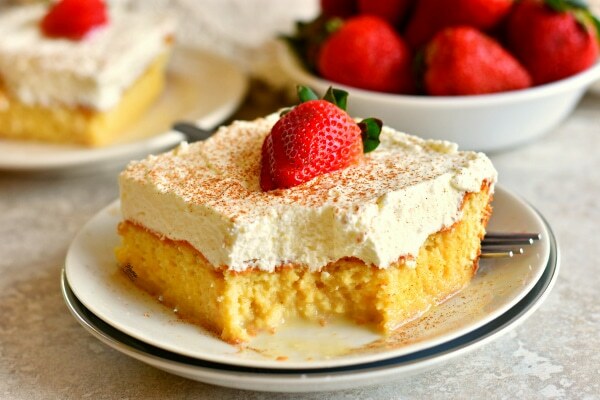 Tres Leches cake is similar to angel food cake when it is baked. It is a light and spongy cake because of the whipped eggs whites in the cake batter. Soaking the cake in the sweet milk mixture totally changes the taste and the texture of this gluten-free cake. It transforms it into an ultra moist sponge cake. Topped with fresh whipped cream, a sprinkle of ground cinnamon and a sliced strawberry it is to die for! I promise no one will even know it’s a gluten-free cake. More Gluten-Free Dessert Recipes to Try! Recipe adapted from Tes Leches Cake from The Pioneer Woman. Preheat oven to350° F .
Pour batter into a greased 9x13 pan. Smooth the top of the batter to make it even as you can. Bake the cake for 35 to 40 minutes at 350 degrees. Please watch your cakes because all ovens are different. Check the center of the cake by inserting a toothpick to make sure it is done. Remove from the oven and allow the cake to cool completely. I can taste it through the screen! Making this for Mother’s Day, thank you! 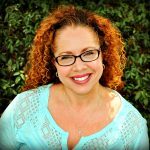 You are so welcome Dana! I love sharing what I make for my family. I hope you enjoy it and have a wonderful Mother’s Day! Perfect Tres Leches Cake! My daughter’s favorite and so delicious!!! I made it for a Cinco de Mayo potluck for a Santa Fe crowd. They loved it and no one knew it was GF, except that’s all I bake. Our hostess took out her Pioneer Woman cookbook when she heard your inspiration. 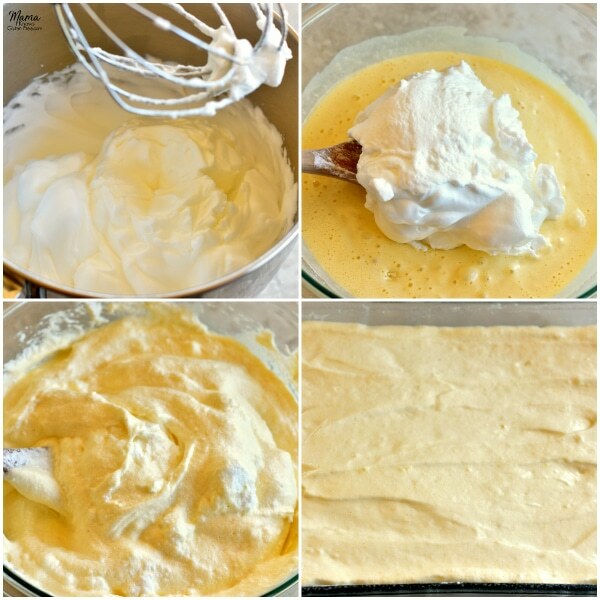 To save time, I used So Delicious frozen whipped coconut cream topping. Topped it with toasted coconut and served fresh mixed berries with it. The leftovers keep well and taste better with age. A great addition to my GF Santa Fe menu planning. Thanks! Thank you so much Marcia! I am so glad that everyone enjoyed it. I love it when one else knows it’s gluten-free. I love Pioneer Woman’s recipes and it’s always fun to try and modify them to be gluten-free. Using the coconut cream topping and toasted coconut and mixed berries sound divine. You are so welcome! I love sharing what I make for my family. I can’t thank you enough for this recipe. I’m almost a year into my diagnosis of Celiac disease, and this recipe turned out so lovely! I am also going to use it in the future as my stand by for Angel Food Cake. Thank you soooo much. I’m excited to try your other gluten free recipes. Hi Heather. This makes my heart so happy! You are so welcome, I love sharing what I make for my family. I’m working on an Angle Food Cake recipe, so I will email you when I have it posted. Thank you so much for the wonderful rating and letting me know that you enjoyed the cake! I bake gluten-free on occasion because I have several friends and family members who don’t eat gluten. This cake was amazing! You can’t tell that it’s gluten-free. I used Bob’s Red Mill all-purpose gf flour. Almost the entire 9×13 pan was gone by the end of the night. I served with strawberries and blueberries. Perfection. I am so happy that everyone enjoyed the cake Jennifer! It makes my heart so happy. I love sharing what I make for my family. Thank you so much and for the wonderful 5-star recipe rating. Thank you for sharing the goodness!!! I am going to try this tonight! Thank you so much Chris for the wonderful 5-star recipe review! You are so welcome, I love sharing what I make for my family. I hope you enjoy the gluten-free tres leches cake. Thank you again! This was the BEST gluten-free thing we’ve had since my husband and son were diagnosed with celiac in December. Thank you so much for taking the time to work this out and publish. The sponge is the perfect base for the strawberry cake my husband’s used to having for his birthday every year since he was 3. Thank you so much Julie for the wonderful 5-star recipe review! I can’t tell you how happy it makes my heart to hear that you and your family enjoyed the cake. I know how hard the transition is to going gluten-free and how important it is to be able to still eat your favorites. That’s why I started this blog. You are so welcome, I love sharing what I make for my family. Thank you again!